Flaherty Fardo, LLC identifies itself as a full-service civil litigation law firm. We competently and routinely handle a wide variety of Pennsylvania civil litigation plaintiff and defense cases including personal injury litigation, medical malpractice litigation, trucking litigation, business litigation, and real estate litigation. We are experienced Pennsylvania trial attorneys who expect each and every case to go to trial. We believe that unless we are fully prepared for trial, we cannot obtain the best verdict or settlement for our clients. Civil litigation involves both the ability to research the law, as well as the skill and personality to explain the law to all kinds of jurors.We will not go trial without the latest in courtroom technology and are proud to advertise our relationship with Precise, Inc., a leader in the advancements of courtroom presentations and technology. We are experienced litigators who appear before state and federal trial courts, administrative agencies, mediators, and arbitration forums. Our civil litigation department appropriately involves all areas of law listed elsewhere on this site, including but not limited to Pennsylvania personal injury, medical malpractice, business litigation, debt collection, civil rights litigation and employment related issues. We offer free consultations on all civil litigation questions you may have via on-line and/or via telephone at 412.802.6666 or toll free 1.877.744.3476. In 1990, the Federal Government enacted the Americans with Disabilities Act. The ADA was established to provide a clear and comprehensive prohibition of discrimination on the basis of disability. In creating the legislation, the Congress concluded that some 43,000,000 Americans have one or more physical or mental disabilities, and this number is increasing as the population as a whole is growing older. Congress also concluded that society has historically tended to isolate and segregate individuals with disabilities, and, despite some improvements, such forms of discrimination against individuals with disabilities continue to be a serious and pervasive social problem. 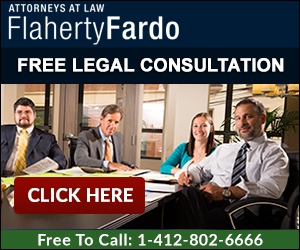 Flaherty Fardo, LLC has successfully tried landmark ADA cases, and has received attention from lawyers nationwide. We look forward to continuing our representation of Americans with Disabilities in the future. We offer free consultations (412) 802.6666, and do not charge a legal fee unless we are successful for our clients.